CC and four other students from her Spanish school and I took an excursion to Volcan Arenal. 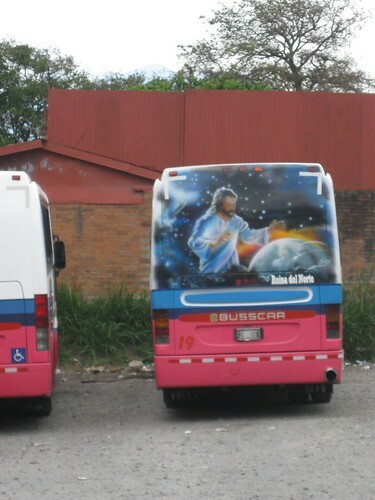 It was their idea to take the $4 public bus for the 5 hour journey from San Jose to La Fortuna de San Carlos, the closest town to Arenal. I’m glad we did because, well, it was $4 and a trip on the Grey Line would have been $80. I can put up with a little overcrowding for $76. After all, we had Jesus on our side. Also – free breakfast. And clean. 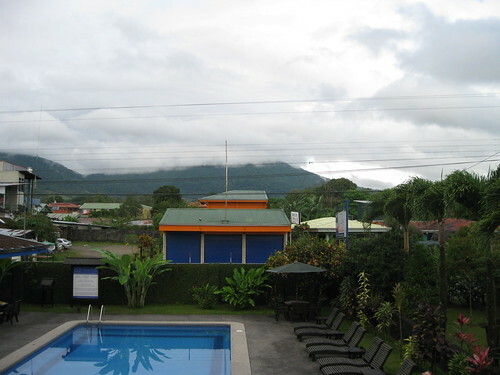 And two nice swimming pools and free internet. I love hotels that try harder. So even though it was 10 pm and even though it was a busy tourist weekend there, the friendly hotel staff managed to round up an amazing all-day, all-night excursion for us the next day – a trip to the swinging bridges, swimming in a waterfall, lunch, a hike around the volcano and dinner and soaking at the hot springs. Hot damn – we were acting like tourists now! Our tour guide, Ana, arrived in a van at 7:30 a.m. and got CC & I and then took off to get our fellow passengers. But we found out our fellow passengers weren’t the other Spanish students (who had chosen to stay at a cheaper hotel) but a bunch of very hale and hearty Dutch retirees with walking sticks. Whaaaa? Ana explained that there were two vans and we would be meeting with the students at our first stop. We begged to switch vans so we could hang with our travel mates and not a bunch of Dutch people who, though very nice, seemed entirely too serious for our mood. Ana was a knowledgeable tour guide, about 24 years old, well-versed in flora and fauna and geology, and was really, really darling to boot, with sparkly gold eyeshadow and khaki pants that fit like a glove. When we got to our first stop, the swinging bridges, we met our other tour guide, who was much more reserved than Ana and who had an unintelligible name. Ana said it a couple times but not one of us could get it. 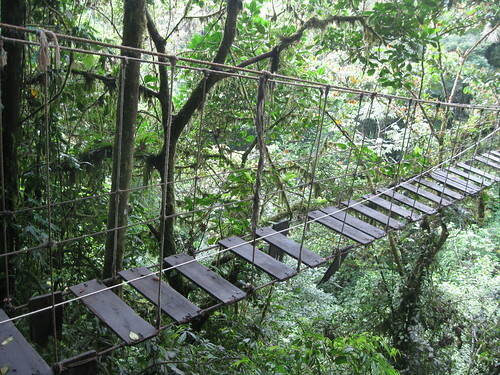 This is not actually one of the hanging bridges. 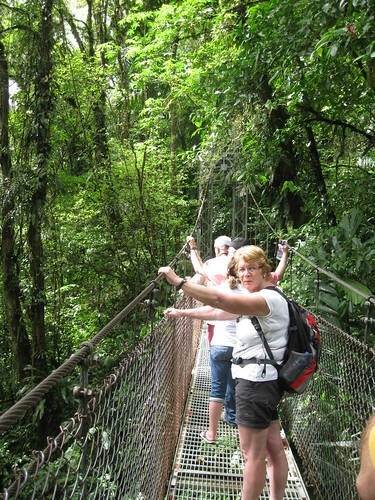 This is for a movie, but I wanted to tell my Mom this is where we went to walk 150 feet above the jungle floor. This is an actual real, safe hanging bridge. With an actual real Dutchie. We got to join our fellow students in van 2 with The Other Guide. All day long, at every stop, our two vans would meet up, but our guide never said anything, letting Ana do all the talking on the hikes. In the van, The Other Guide didn’t talk and would barely meet our eyes. Ana had told us that The Other Guide was in training. I thought about taking Ana aside and telling her The Other Guide should train harder or maybe find a job where she didn’t have to interact with the public, because she seemed so painfully shy. It wasn’t until 2 days ago that it hit me. I finally got it. I started laughing out loud. It was a choice for Ana between turning down 6 tourists at $140 per person, or roping her shy friend into wearing one of her polo shirts. Ana stuck us with The Other Guide because she knew we were a bunch of goofballs, unlike the Dutchies, who actually wanted to learn something about the flora and fauna and geology. I’m not mad. If I were Ana, I would have done the same thing. It took me so long to figure out. Us tourists are kinda dumb, which Ana obviously had figured out.